Hello! As promised, today I have my mani for March's 'Donuts' MeeBox to share with you. If you missed my initial unboxing and swatches, you can find that here. With all the goodies we recieved, and a theme as fun as Donuts, it's not hard to guess what kind of nail art I went for. 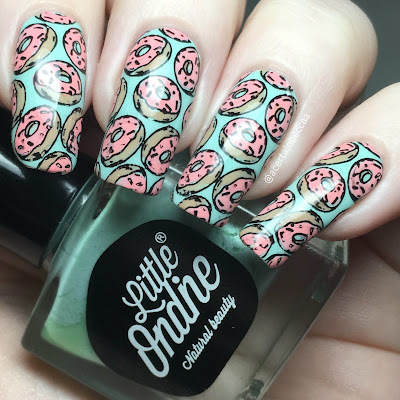 Read on for more info on my bright Donut mani! I started off with a base of Little Ondine peel off polish 'Ripple', a bright minty creme. 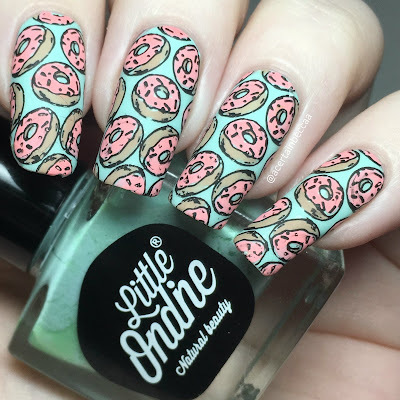 I then made donut decals using Sugar Bubbles stamping plate SB 055, stamping in black and colouring in with Kure Bazaar 'Cappucino' and Deco Miami 'Cake'. I carefully trimmed and placed the decals onto my nails, leaving them matte. What do you think? Do you prefer them matte or glossy? I really do like the matte - I always say this but I don't matte my nails nearly enough! I do love the glossy version too though, and the mani overall. It really reminds me of the Simpsons thanks to Homers love of pink donuts!